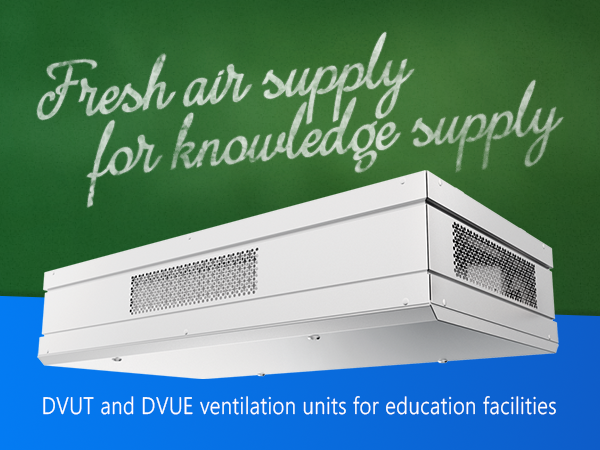 Introducing the new DVUT and DVUE series single-room air handling units by VENTS. The new models are intended for decentralised ventilation of schools, libraries, conference rooms, offices and other spaces. Air quality directly affects people’s working capacity and how happy they feel irrespective of age or occupation. Closed spaces where people stay inevitably limit their access to fresh air. In the world of today ventilation of spaces with a large number of occupants has turned into a serious challenge. Many educations, public and commercial institutions still rely on the so-called natural ventilation which means airing the spaces only by means of opening a window or vent pane. Such air exchange is by no means proper or sufficient as fresh air is supplied as is with all the dust and dirt whenever someone decides to open a window often creating a draft which may cause a cold, hypothermia and other diseases. Such ventilation method is also quite wasteful in terms of heat. To avoid such consequences natural ventilation is used as rarely as possible which results in a drop of oxygen levels, leads to the development of odours, and contributes to mould growth. Poor oxygenation causes drowsiness, tiredness and headaches, and makes it difficult to think clearly. These consequences of poor ventilation can adversely affect the performance of students or intellectual office workers – and that is not to mention the health impact. However, setting up a conventional ventilation system in a building may present a significant challenge for a number of reasons. First and foremost, the installation work is time-consuming. It also requires laying a system of air ducts and conducting complex construction and assembly work. And last, but not least a conventional ventilation system can ruin the interior aesthetics. The VENTS DVUT and DVUE air handling units were developed to address the challenges of providing spaces with fitting proper ventilation, ensuring continuous fresh air supply and saving the heat energy otherwise lost during air exchange. These units provide a simple yet efficient ventilation solution for educational, public and commercial spaces. A compact footprint makes the units suitable for both completed buildings and those undergoing renovation. Since the installation only requires minimum modification of the structural elements of the building the original interior remains intact. Fresh air is supplied through a short duct in the wall with low internal resistance for additional energy savings. The units can be mounted onto the floor (DVUT HB EC and DVUE HB EC) or suspended under the ceiling (DVUT PB EC). DVUT and DVUE air handling units are designed for energy-efficient operation. As the centrifugal exhaust fan extracts warm stale air outside the air stream passes through a filter and a heat exchanger. The heat exchanger accumulated the heat energy of the extract air stream. The fresh outdoor air delivered into the space by a centrifugal supply fan also passes through a filter and then through the heat exchanger. The heat exchanger releases the accumulated heat of the extract air thus ensuring supply of warm clean air into the serviced space. Heat recovery efficiency reaches 97% for the DVUT HB EC and DVUE HB EC models and 94% for the DVUT PB EC units. The DVUT and DVUE air handling units are based on low-energy EC motors. The maximum air capacity of the DVUT HB EC and DVUE HB EC models is 550 m3/h or up to 510 m3/h for the suspended DVUT PB EC models. The unit type and performance selection is based on the individual requirements of each particular space. The control equipment automatically adjusts the unit speed to ensure the proper air quality. Silent ventilation has always been a top priority for offices and schools. The units are fitted into heat and noise-insulated casings which reduce ventilation heat losses and block off the annoying noise to help occupants concentrate on work or study. The DVUT and DVUE single-room air handling units mark a quantum leap in arranging proper air exchange in spaces – quickly and easily. High energy efficiency, outstanding performance and low power consumption combine into a winning combination for quality ventilation of a great variety of spaces.